HexaGroup specializes in 3D animation, interactive design and technology and we use it to assist clients with a vast array of marketing, training, corporate presentation and R&D efforts, especially in the upstream, midstream and downstream oil and gas sectors. 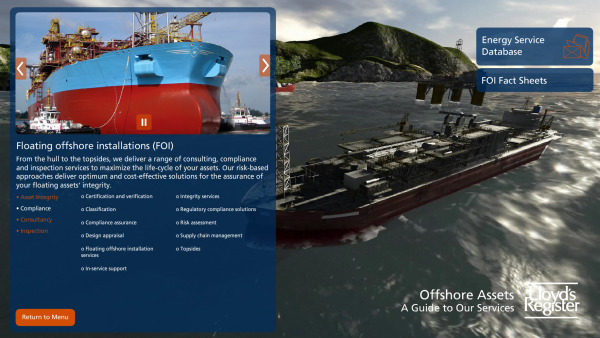 One of our latest projects let us use interactive 3D animation to develop multimedia presentations for the Lloyd’s Register booth at SPE Offshore Europe 2013. Lloyd's presented an overall tech savvy booth. They displayed a mix of CGI presentations depicting the role of Lloyd's Register for all offshore oil and gas environments and assets, a BOP specific movie, and information screens listing the company's key events at the show. This year's exhibition and conference was the largest in the history of the event attended by representatives from 37 countries and at least 1500 organizations in the oil and gas industry. Visitors would be inundated with hard copies of marketing materials and tchotchkes to carry while touring the exhibit floor. But it wouldn't be from Lloyd's Register. At the Lloyd's booth, two 46-inch touchscreen kiosks mixed animated 3D graphics with a web-based ordering system. The system provided visitors with access to hundreds of marketing collateral and data sheets through an easy to use interface. It was a paperless booth that allowed visitors to search, select, and send information to themselves via email through the touchscreen kiosk. 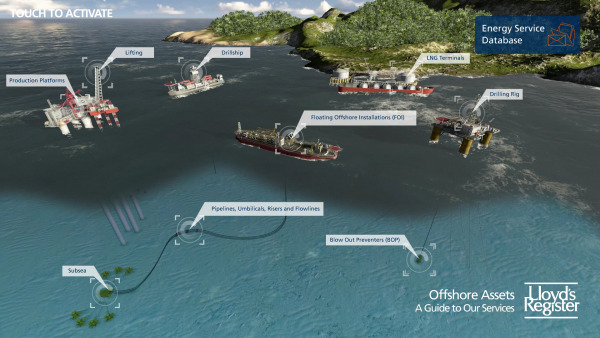 The 3D animated interface in the photo above represents an upstream offshore oil and gas environment. Visitors were able to explore the details of Lloyd's Register services for each asset including lifting equipment, production platforms, drillship, LNG terminals, drilling rig, blowout preventers (BOP), pipelines, umbilicals, risers, flowlines and multiple subsea equipment. The new generation of kiosk combines the 3D with web based technology for immediate access and delivery of information providing a paperless environment. Within each asset visitors could access related marketing materials and data sheets, then select and send it via email. In exchange, Lloyd's was able to effectively track and manage their tradeshow leads. 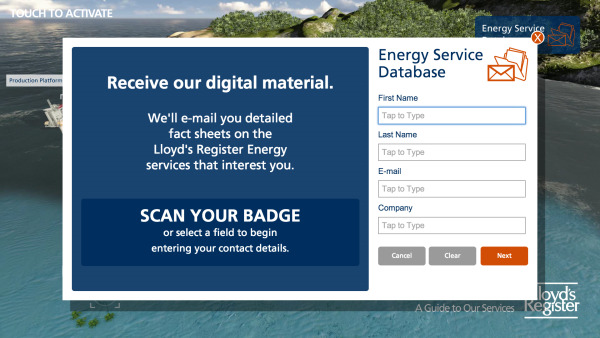 The custom kiosk was set up to automatically synch with Lloyd’s CRM and identify which materials were of interest to contacts. This type of insight helps to conduct smart follow-up and sales outreach. As of now, the kiosks operate on a web based platform. Soon they will be adapted for tablet devices. They currently display in multiple languages including English and Portuguese. Have you considered where or how 3D marketing can fit into your marketing outreach, training exercises, and presentations? Download our 3D Animation E-Book and explore the uses and value of 3D as a marketing medium. In the book, see how other leading energy companies have used the technology throughout their organizations.